Well, I bought some sweets from the local shops and waited for the trick-or-treaters. Despite the abundance of small children running around the neighbourhood in fright-masks and cloaks (and an alarmingly high number of mothers with push-chairs wearing big pointy witch-hats) nobody knocked. I am not sure if I am annoyed or relived. We had a guest tonight and so didn’t really want to be disturbed but not one knock. Perhaps I frighten the locals! I never knew I didn’t know this. Recently I may have professed that I knew the difference between affect and effect and it is confirmed for me today online at Common Errors in English. I did not think that Xmas was a way of removing the Christ from Christmas but more of a lazy person’s way of avoiding writing letters. Turns out, I was wrong and the X is an abbreviation of the Greek for Christ [Source]. Just goes to show that I know nothing. Michael Caine is excellent in The Quiet American. 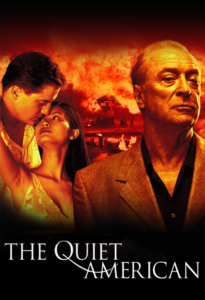 Thanks to the joy of dvdsontap, I have just watched Michael Caine in The Quiet American, the adaption of Graham Greene’s novel about an American spy, Alden Pyle (Brendan Fraser). Pyle is a US agent who is backing an anti-communist force in Vietnam and befriends British journalist Thomas Fowler (Caine) before ending up part of a love triange with local Vietnamese girl, Phuong (Do Thi Hai Yen). Caine was superb as the Siagon-based reporter – an understated performance that steals the show. The movie is well produced and the atmosphere of the Far-East brilliantly portrayed. I would never have gone to the movies to see this but I am so glad that I added it to the DVD list. 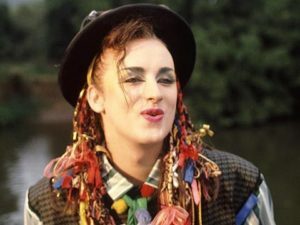 I’ve just been out and bought Erasure’s Hits collection. Now, I own all the original albums so I am not entirely sure why I went and bought it. 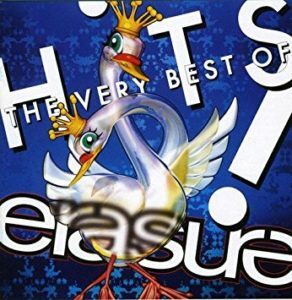 Still, I now own the CD so it can sit on the shelf alongside all the others and I will pride myself that my Erasure album collection is complete. Phil Gyford posted an interesting question about CDs and what would happen if they were all stolen. I have ripped a good number of my CDs but I would miss the originals if I didn’t have them. There appears more value in holding an original CD case with the lyrics, photographs and the notes. I would have to try and replace a good number of them because I would miss them. A little like software, it’s good to have all the originals just in case something happens. I just can’t seem to get it together to write the things I want to write. Is it writer’s block? I really wanted to write something about motivation but I am not able to motivate myself to think about what’s buzzing around in my head. To be honest, I am beginning to think that my ability to compose sentences and string together words is leaving me. It’s not that I have any difficulty thinking about the things I would like to write here but I have difficulty actually writing it. My head is full of random thoughts but I am not managing to get them into anything coherent. Failing in this way is actually proving to be quite depressing to be honest. I wanted to write about a post over at Strange Little Boy which talks about using a wireless connection in a public place – but I can’t get to the point of that one. I also wanted to write about the development of online technologies and my personal frustrations seeing a lot of the technologies I am interested in being developed outside of the UK. Again, I am suffering some kind of block. So, I am off to meet a friend for pizza this evening. This will allow me to clear my mind with friend-pizza-eating-trivia and, also, to avoid the television which, after last night’s Dawson’s marathon, will be no bad thing for my brain. Perhaps I shall welcome tomorrow with a clearer mind. Four episodes of Dawson’s Creek. I may need a doctor. I just watched four Dawson’s Creek episodes in a row. Have I, somehow, wasted an evening? Well, anyway, it included episode 611 where Jack and David eventually kiss (review). The annual gay kiss was somewhat lacking in any emotion. 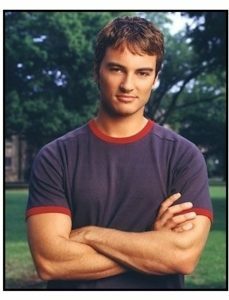 Still you do get to look at Kerr Smith!